Millions of grilling enthusiasts take to their backyards each year to cook delicious foods over an open flame. Grilling is embedded in the history of many cultures, and to this day many people feel nothing beats the savory flavor characteristic of grilled meats, poultry, seafood, and vegetables. Although many people safely enjoy outdoor barbecues every day, accidents can happen. According to the U.S. Fire Administration, roughly 6,000 grill fires take place on residential property every year in the United States alone. Many grilling accidents can be prevented with some safety precautions and a little common sense. When grilling, place the grill in a safe location. Grills should be at least 10 feet away from the house when they are in use. Also, keep the grill away from wooden overhangs or other structures attached to the house, such as garages and porches. Before using a gas grill, inspect it to make sure there are no gas leaks. Ensure hoses are properly connected and that the grill looks in good repair. Use propane and charcoal grills outdoors only. Never bring such grills into your house, even if it seems like there is ample ventilation. Potentially fatal carbon monoxide can build up quickly. Keep children and pets away from the grill area. 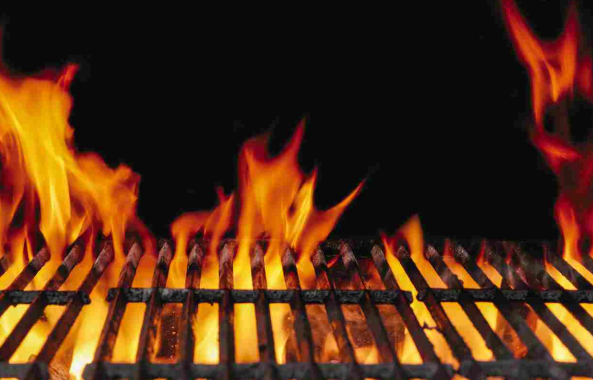 Grills can be knocked over easily, and kids and pets may burn themselves if they bump into a hot grill. Clean the grill regularly. Grease and fat buildup forms in the tray below the grill and can be quite flammable. By brushing off the grates after each use and periodically removing food and grease buildup, you can prevent flare-ups that may ignite the grill. Always tend the grill while cooking. Walking away for even a minute may lead to accidents. Store unused propane tanks upright at all times to prevent leakage. Keep them outdoors and beyond the reach of children. Never smoke near propane cylinders and never move a lit grill. Keep a fire extinguisher handy in the event of a flare-up. A hose may not prove effective on a grease fire. It’s also important to emphasize food safety when grilling. Invest in a food thermometer so you can test the internal temperature of foods and prevent foodborne illnesses. Grilling is a great and flavorful way to cook. But safety must remain a priority when grilling.